I didn’t jump into this series right when it came out on Netflix, but now I am hooked. The joke density is high–if I’m sleepy or feeling sluggish, I don’t watch this show because I know I’ll miss some of the jokes. I’ve laughed out loud in every episode. In one of my recent favorites, Titus discovers that gets better treatment from the general public if he’s in his werewolf costume (for work) instead of just walking down the street as the African American man he is. 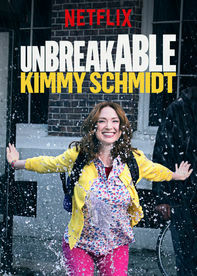 Ellie Kemper’s sunny persona really works here. I tried a new scone recipe from Eating Well magazine this week. I used whole wheat pastry flour instead of white whole wheat, and used almond milk in place of the cow’s milk. I also split the batch in half so I could make two variations, chocolate-craisin & morning glory. A morning glory scone with a side of Ron Swanson is a great start to the day. We got to hang out with some good friends we don’t see very often last night. 4 out of the 6 live in town, but the others came all the way from Virginia for a visit. Our evening included so many favorites–delicious food, great conversation, and a hilarious game. Funglish was the game of the evening (I know, it sounds more like a disease than a game). In this game, you use adjectives (only the ones provided on cards) to describe various words. If I give you the words black, white, paper, not living….would you guess newspaper? Funglish is great fun, and I recommend tracking it down for a fun evening with friends. Oh, and we also had homemade chocolate cake with salted chocolate ganache made by yours truly. Kids are awesome. And music education is super important! The sun is shining, it’s warm, and we have a porch swing! The beginning of the raspberries. We got some chard and after prepping the leaves, I couldn’t bring myself to throw away the stems. So I boiled some vinegar, sugar, salt, pepper and smoked paprika, and then threw in the stems. I boiled a bit too long and they were mushy instead of crisp, but the flavor was great. Later in the week, I had some extra chopped carrots that didn’t make it on to our salad, and I threw those in the jar too. A few days later, they were awesome. We don’t have a TV, but we have a cable package, because Comcast says it’s cheaper and that makes total sense. So now we have access to HBO, and I made my way through Silicon Valley very quickly. 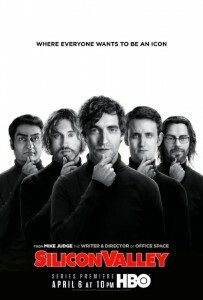 It’s by Mike Judge, so think a modern Office Space with enough nerd humor to make it extra enjoyable to me but not so much nerd humor that it would be inaccessible. Best cheese steak sandwich west of Reading, PA., and coconut macaroon pie. Yum.